Meteoric Resources NL (ASX:MEI) this morning announced it had finalised its initial drill programme for its Midrim copper-nickel project, 85 kilometres south of the copper mining and smelting region of Rouyn-Noranda in Quebec, Canada. The exploration team has drilled 15 NQ diamond core holes; reopened four historical holes for geophysical survey; undertaken down hole electromagnetic (DHEM) surveying of 21 holes and 5.6 km of surface electromagnetic surveying on eight lines over the Midrim, Midrim West and North Gabbro prospects; and competed 900 line-metres of surface electromagnetic surveying over the Midrim North geophysical target. To date, 2270 metres of diamond drilling has been completed at Midrim, intersecting thick zones of massive sulphides. While re-opening several historical holes, three holes were twinned to collect fresh samples for verification assaying and to allow for a geological review of lithologic relationships through the mineralised zone. 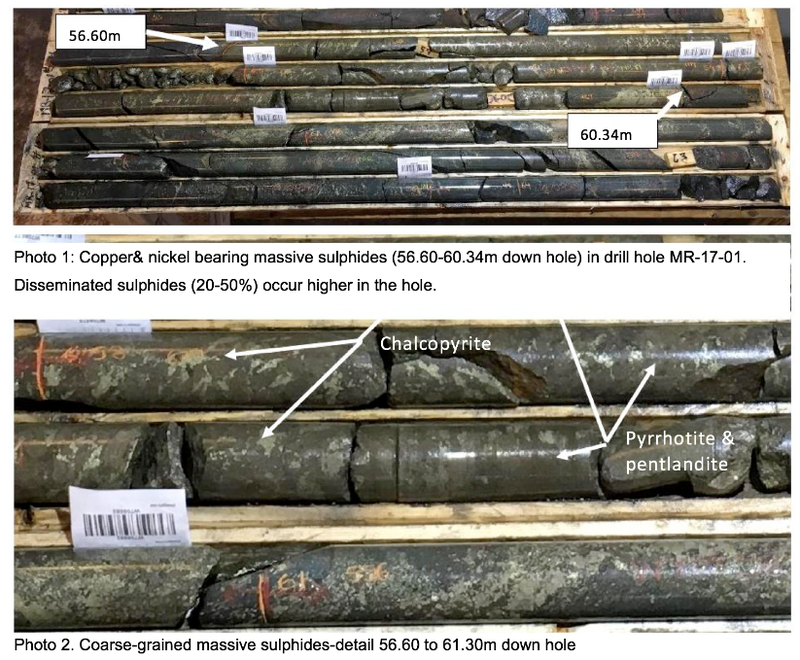 The below photos show one of the massive sulphide intersections — ‘massive sulphide’ refers to over 80 per cent sulphide minerals — with mineralisation consisting of chalcopyrite, pyrrhotite and minor pentlandite. Eight exploration holes were drilled at the Main Zone, Midrim West and Midrim East, to infill and test for extension of the mineralised zones. 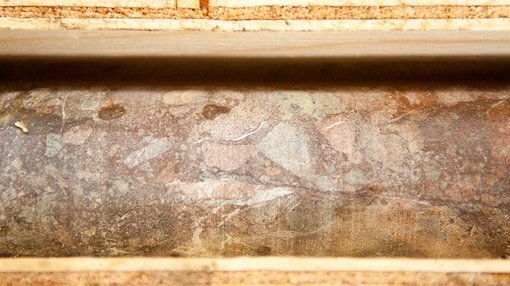 In addition, two holes were drilled at the Lac Croche prospect to extend the copper-nickel mineralisation which was intersected in historical drill hole MR00-11. Another drill hole, MR-17-14, intersected minor blebby sulphides (5-20 per cent) at 480 metres down hole. Logging and sampling of all the core from the drilling programme is now underway, and the company expects to release results in early 2018.